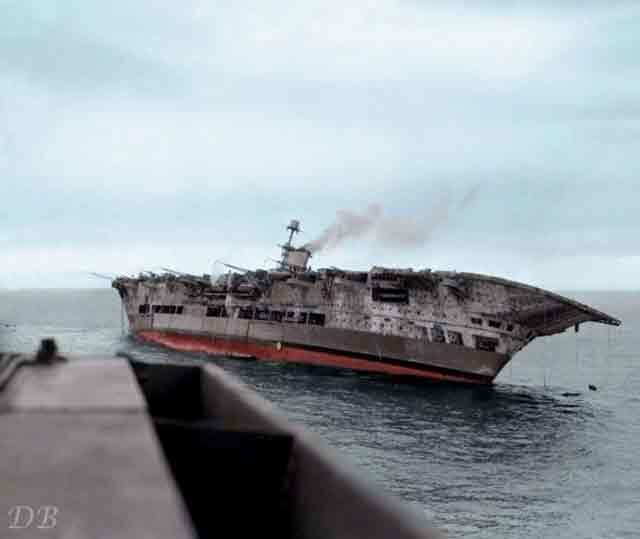 "HMS ARK ROYAL after she had been hit, listing heavily to starboard. Fairey Albacore aircraft are seen on the flight deck." Ark Royal was torpedoed by U-81 (Kptlt. Friedrich Guggenberger) near Gibraltar on 13 November 1941. 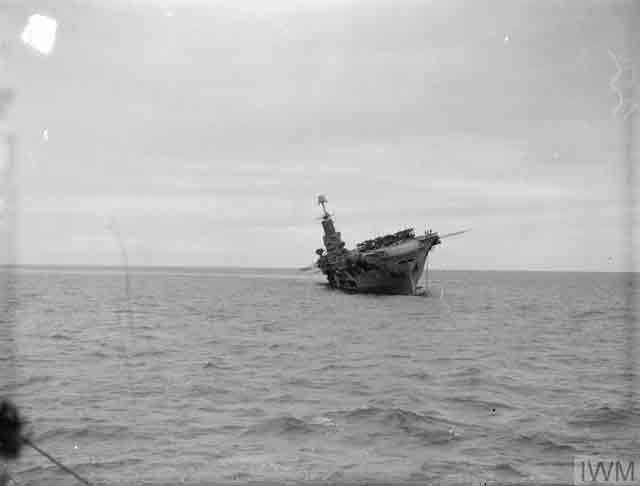 Ark Royal eventually sinks on the morning of 14 November 1941. © IWM (A 6336). Eastern Front: It is decision time on the Eastern Front on 13 November 1941. Winter is setting in, and the Wehrmacht is still over 100 kilometers from Moscow, its current Operation Typhoon objective. During the summer there did not seem to be any time pressure, but now there is because winter is closing in. The Germany Army retains the initiative, but it is unprepared for winter combat. There is no antifreeze for the vehicles, meaning they must be run virtually continually, putting a strain on men and machines and also letting the Red Army know the Germans' exact positions. The men are getting frostbite in the -22° C weather dark summer uniforms make everyone a target against the snowy backdrop. The time has come to halt operations and dig in to await the spring - or has it? Army Chief of Staff General Franz Halder calls the chiefs of staff of the three army groups to Orsha to tell them what the high command has decided. 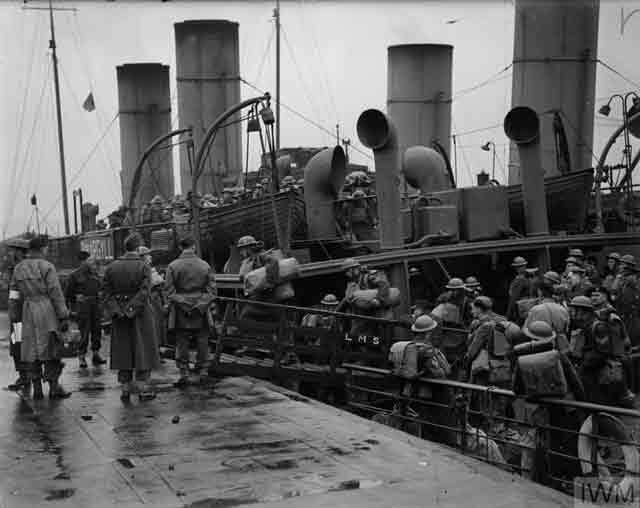 Canadian troops arriving at Gourock, 13 November 1941 (© IWM (A 6363)). The meeting is held at 10:00 in Halder's command train, which is parked at a siding in the town of Orsha, which is located midway between Minks and Smolensk. In attendance are Lieutenants-General Kurt Brennecke (chief of staff of Army Group North), Greiffenberg (Center) and General of the Infantry Georg von Sodenstern (South). Also present but more as observers than participants are the chiefs-of-staff from seven of the ten armies operating in the east (from north to south, the Eighteenth, Sixteenth, Ninth, Fourth, Second Panzer, Sixth and Seventeenth). "From on board HMS LEGION, the destroyer that took off the survivors, showing some of the last to leave ARK ROYAL." 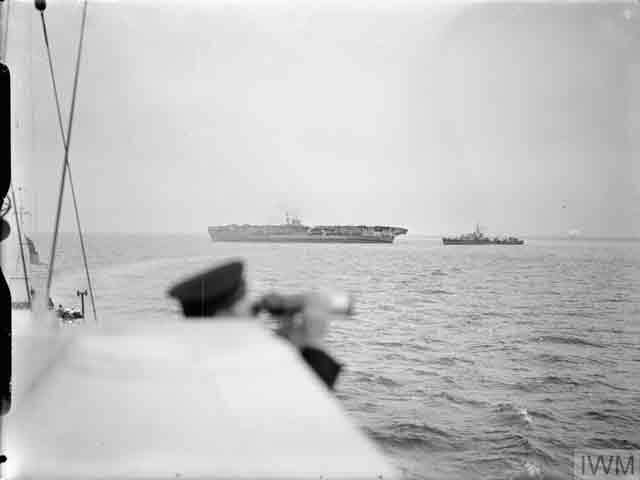 13 November 1941 (© IWM (A 6315)). Halder begins the meeting with what is intended to be an inspirational speech that portrays the current situation in the most favorable light. He concedes that a "decision" is no longer "100% attainable" in the limited campaigning time left in 1941. However, since the war to date has reduced the Red Army's strength "by at least 50%," the Wehrmacht had to remain on the offensive for the time being "to maximize damage to the enemy." It is not the most logical presentation, but it does make some sense - if you believe that the Red Army is on the verge of collapse. That is not the case, however, and the men listening in the railway car know this. 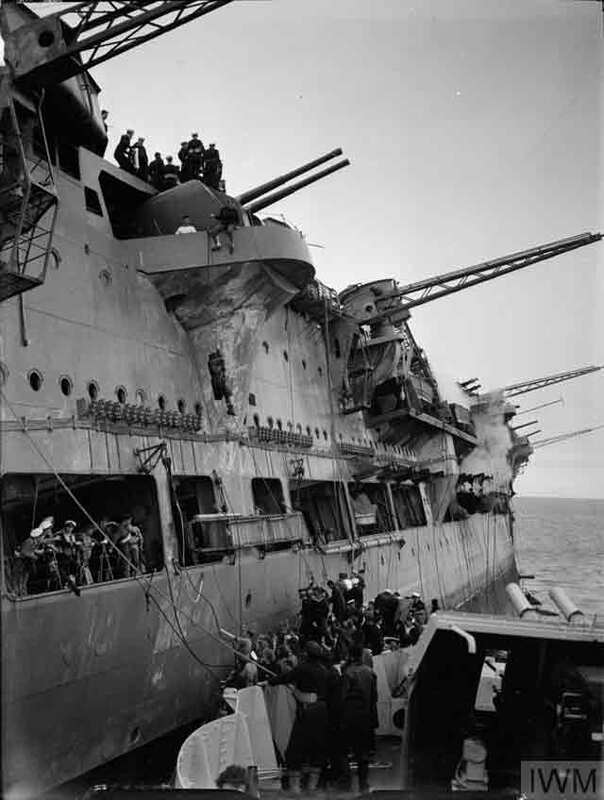 "Survivors on board HMS LEGION leaving the torpedoed ARK ROYAL, which is seen in the background, she is listing 18 degrees to starboard. HMS LAFOREY is approaching the aircraft carrier to led assistance in providing water and power." 13 November 1941 (© IWM (A 6316)). Colonel Eberhard Kinzel, the head of Foreign Armies East, then gives the OKH's estimates of Red Army strength. After admitting that pre-war estimates that the Red Army had 140 divisions were faulty, Kinzel further admits the Soviets have been able to raise new forces during the conflict faster than expected. Kinzel estimates that now the Red Army has 160 divisions remaining in the European Theater of Operations - a large number, for sure, but any finite number is reassuring given the seemingly endless ability for the Soviets to find additional troops whenever needed. Given the rushed recruitment of new soldiers, Kinzel further assures that the real strength of these 160 remaining Soviet divisions is actually 75 regular divisions. Due to Lend-Lease assistance and further recruitment, though, Kinzel concludes that the Soviets could double those 75 divisions by spring - making their destruction now before that can happen all the more important. 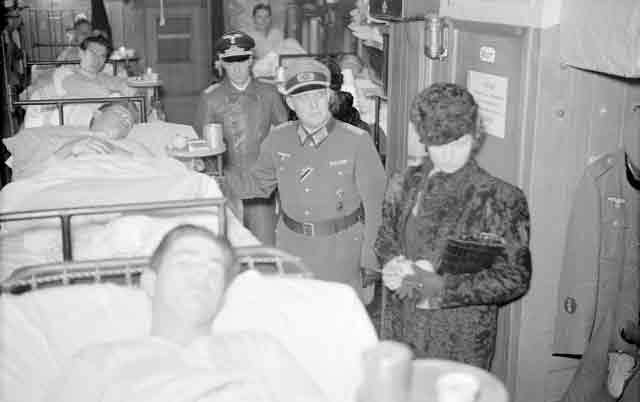 Swedish Princess Sibylla of Saxe-Coburg and Gotha visits a German hospital train in Krylbo on November 13, 1941, in company with German officers. Sibylla was a great-granddaughter of Queen Victoria and mother of Swedish King Carl XVI Gustaf, who reigns as of 2019 (Järnvägsmuseet). Following Kinzel are two supply officers, chief of the OKH Organization Branch Major-General Walter Buhle and Quartermaster-General Eduard Wagner. Buhle concedes that due to war losses, the army will have to disband fifteen entire divisions "to create reserves." In addition, the size of panzer divisions is to be reduced and no more trucks can be expected to ease supply problems. Wagner adds that ammunition production was lowered during the year in anticipation of a quick victory, and thus shortages will occur during the first half of 1942. After everyone breaks for lunch, Halder asks the army group chiefs of staff what they think should happen. Brennecke and von Sodenstern suggest going immediately into winter quarters, while Greiffenberg - whose army group is the one that would gain the glory of capturing Moscow - is at best lukewarm. Sodenstern makes the memorable and very sour observation that the war was not being fought in France and it was not the month of May - suggesting that the drastically different circumstances could lead to a drastically different outcome. The opinions of the attendees are irrelevant, however, and Halder concludes the meeting by handing out pre-printed copies of the plans for the final stage of Operation Typhoon - which is to begin virtually immediately. French soldiers of the Charlemagne Legion (French soldiers voluntarily fighting for the Wehrmacht) in the central Soviet Union, November 1941 (Momber, Federal Archive Bild 101I-141-1257-16). The Orsha Conference commits the Wehrmacht to an effort to win the war in 1941 by capturing Moscow. The decision to continue attacking is based on assumptions based on information sources that already have been proven to be faulty. Most importantly, it completely disregards the degraded state of the German military, which is very well known by everyone involved. Attacking into the winter is a dangerous gamble because it exposes the troops to the elements and to counterattack in unfavorable circumstances. 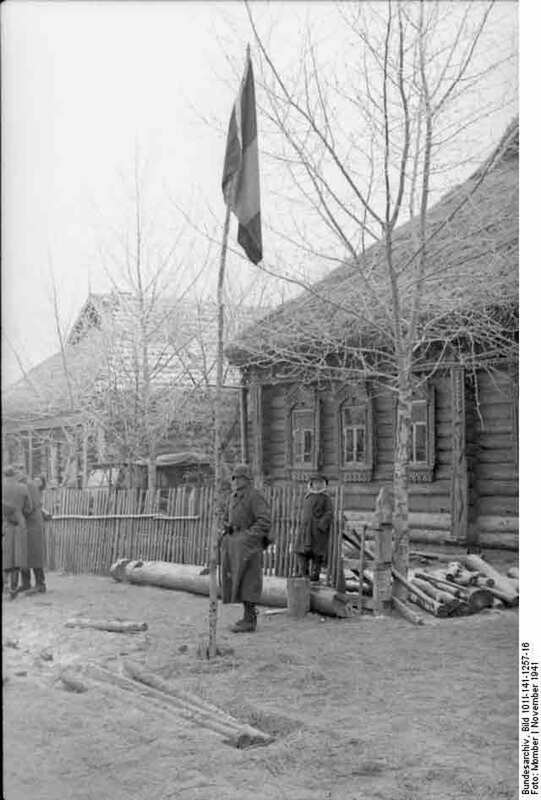 The decision is based on the hope that the Red Army is on the verge of collapse, but if that is not the case, continuing Operation Typhoon could have devastating consequences for the German Army. 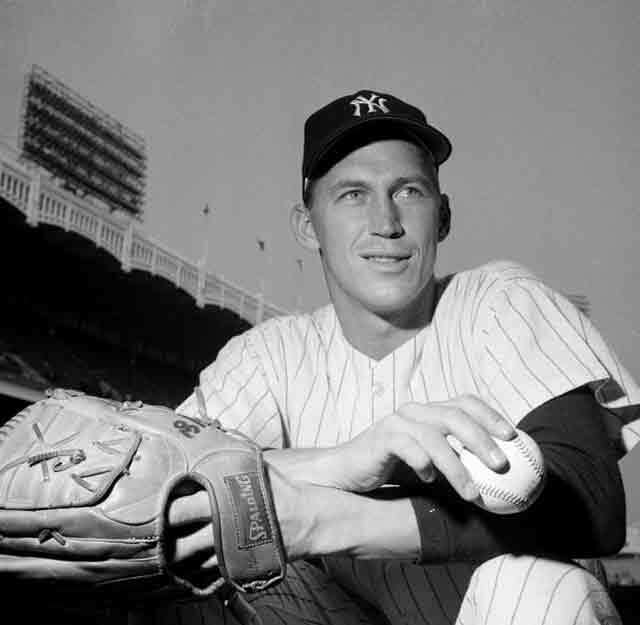 New York Yankees pitcher Mel Stottlemyre, born on 13 November 1941 in Hazleton, Missouri and grew up in Yakima, Valley Washington. Mel Stottlemyre passed away on 23 January 1941.